Located within the Parque Alameda Commercial Plaza, in the Historic Center, very close to Mexico City's main attractions, such as the Cathedral, the Casa de los Azulejos, Bellas Artes and countless museums. The hotel is situated just minutes from Reforma and Polanco Avenues, and important business, commercial and social districts. Fiesta Inn Centro Histórico is a responsible hotel, so it is a 100% smoke free hotel. The Fiesta Inn features a restaurant which opens from 6:00 a.m. until 11:00 p.m. and is an excellent choice for breakfast, lunch and dinner. Enjoy dishes from our buffet or menu, as well as our Sunday brunch. 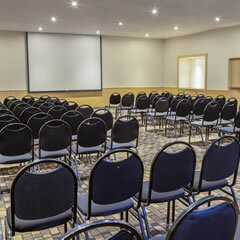 It also features 4 event rooms that can be adapted to host up to 210 people in an auditorium; each room has a board, electric screen, flip charts, coffee service and personalized service. Our professional team will help with your groups and conventions. "Perfectly Fine Hotel - Inexpensive, Centrally Located, Clean & VERY inexpensive." Everyone at the hotel was courteous and helpful, clean room and bathroom. We needed extra toiletries which were provided in a timely fashion. We would definitely go back to this friendly place, besides it is located at the heart of this enormous city !! "Great little find in the historic district "
"Couple of days at meetings"
Had to attend various meetings for a couple of days in Cd de Mexico and stayed at Fiesta Inn Centro Historico. Had a great view of Alameda Park. The Jr Suite was nice and comfy. As you open the door there is a big living room with a dinning table and desk. Then you walk into the bedroom that also has a small lounge seats. The restroom has a bath tub. This all rounded up in a nice stay. Almost forgot to say that the staff is really courteous and helpful. Whether traveling for work or pleasure, you will feel instantly relaxed when entering these spacious rooms with minimalist design and laminated floors. Each room has a king bed, 32" LCD TV, two telephones, and work desk with high-speed wireless Internet. They also offer a bathroom with tub, air conditioning, security safe and ironing kit. Each room has a view of the famous Juarez Avenue (subject to availability), and everything you need for an enjoyable stay, including 24-hour room service and a travelers kit. These spacious rooms feature minimalist design and laminated floors, making them ideal for rest and relaxation. Each room has two double beds, 32" LCD TV, two telephones, and work desk with high-speed wireless Internet. They also offer a bathroom with tub, air conditioning, security safe and ironing kit. Each room has a view of the famous Juarez Avenue (subject to availability), and everything you need for an enjoyable stay, including 24-hour room service and a travelers kit. A spacious room with 2 areas: living room and bedroom; featuring 1 king-sized bed, microwave, mini refrigerator, 2 televisions (one in each room), 2 phone lines and a spacious desk. The room is 30 m2 and is equipped to meet the needs of handicapped guests: 1 King size bed, 29" TV, desk, telephone, a bathroom equipped with a 1 meter high handrail, shower and toilet with special safety bars.